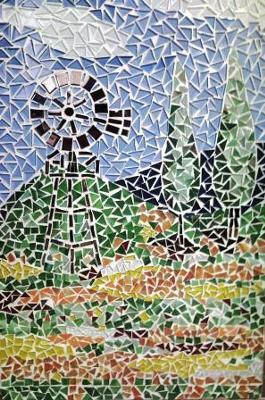 My South African farm mosaic was the first 3D project. A friend asked me to make something for a focus point in his garden. I've surfed the internet just for inspiration. Well I just could not think of a something. At the end I took out my photo album of our 2008 vacation in Namakwaland in the Cape, the windpump in one photo, the trees and all the flowers of that region. I've combined 3 photos. This is the result, a combination of lead-glass and tiles. The size of this piece is 1.2m X 800mm. Hard work but satisfactory.